Senate Majority Leader Mitch McConnell speaks on Capitol Hill in December alongside House Speaker Paul Ryan. As their first major act of the new Congress, Republicans rushed approval of a budget resolution this week that sets up a framework for repealing Obamacare, but what exactly to replace it with is still a puzzle Republicans are piecing together. And it could take a while. "We're not holding hard deadlines, only because we want to get it right," House Speaker Paul Ryan, R-Wis., told reporters this week. The budget resolution does include a Jan. 27 deadline for committees to report back with repeal legislation, but lawmakers have made abundantly clear they're going to blow past that date. Ryan says Republicans will use their annual GOP retreat for a "full, exhausting" conversation on how exactly to repeal and replace the law. The go-slow approach is at odds with the increasing urgency of the rhetoric on the state of the Affordable Care Act. "We are on a rescue mission to prevent Obamacare from making things even worse," Ryan pledged. 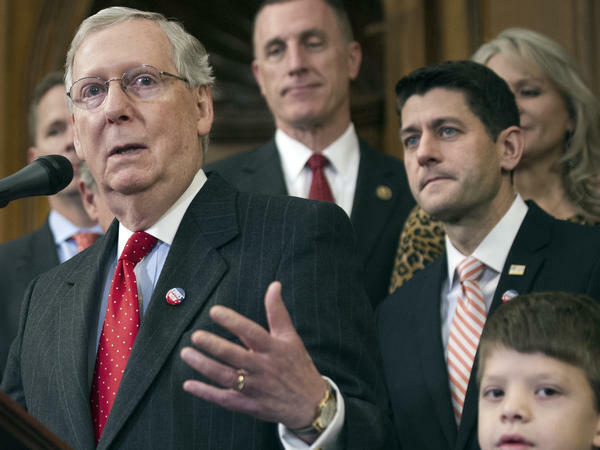 Congressional leaders and President-elect Donald Trump have pledged that repeal legislation and the GOP alternative to replace will occur at roughly the same time. Trump this week pledged it will happen "essentially simultaneously." The incoming president said they will not offer a plan until his nominee for Health and Human Services secretary, Rep. Tom Price, R-Ga., is confirmed. Republicans expect a significant amount of the repeal effort to come through executive action by HHS since much of the implementation of Obamacare was done through the same agency. In Congress, lawmakers say they want to use piecemeal legislation to address specific issues. There is stiff political resistance among Republicans to voting on one, sweeping legislative package. The Affordable Care Act was 2,700 pages, and Republicans these days are generally distrustful of behemoth bills. They are too hard to explain to the public; their constituents hate them; and it's too easy to tuck in provisions they might regret voting for down the road. Republicans have promised to keep intact some of the more popular provisions of the law. They say people with pre-existing conditions will still have access to health insurance, and that parents can keep their adult children on their health plans until age 26. House Republicans offered a broad outline for reform in 2016 that provides the foundation for what they will try and do this year. That plan repeals the individual mandate, which is a pillar of Obamacare. Instead, it would create new tax credits to incentivize individuals to buy insurance, but it wouldn't penalize them if they don't. Ryan discussed this at a CNN town hall on Thursday. "We want to instead have tax credits, so that everybody can ... take their tax credit and go buy a health care plan of their choosing," he said. "And that's the other thing — we don't want to make people buy something that they don't want to buy. We don't want to force them to buy all these different benefits." There is also loose consensus in the House and Senate to remove mandates on essential health benefits that insurance plans must cover and let states decide minimum coverage. Republicans also plan to use the repeal legislation to cut off funds for Planned Parenthood, which received federal funds through Medicaid reimbursements for services. Planned Parenthood is a political target for Republicans, who oppose the health care provider, because they provide abortion services. Instead, Republicans want to redirect those federal funds to health clinics that do not offer abortion services. Broadly, there is a philosophical debate here about whether the federal government has an obligation to insure all Americans, or whether Americans should decide whether or not to have insurance. Republicans have pledged that no one who has insurance through the ACA will lose it, but without a mandate the number of insured Americans could drop. The other major challenge facing Republicans is cost. The party, at its core, is resistant to expanding federal entitlements and spending, but they have pledged to create better health care coverage options at lower costs. Those two promises are hard to reconcile, particularly for a legislative product that will have to be assessed by the Congressional Budget Office for its impact on the federal budget. Lawmakers say the most ambitious timetable to see a legislative product take shape is late February, although others caution that this debate could consume most of 2017. For all the Republicans' ambitions on health care, there are still certain legislative realities they have to face. The most significant is in the Senate, where replacement legislation will likely need to pass a 60-vote hurdle, and that means bringing some combination of Democrats on board. That's why GOP senators are taking a more measured approach. For instance, Health, Education, Labor and Pensions Committee chairman, Lamar Alexander, R-Tenn., a key negotiator, has already taken Medicare off the table as part of any health care negotiations, because it would repel any Democrat from engaging in talks. What are the political calculations? Democrats advanced Obamacare after winning an election that delivered control of Congress and the White House. In hindsight, many top Democrats have reflected that the party tackled health care when the country was really aching for economic relief. "Americans were crying out for an end to the recession, for better wages and more jobs; not for changes in their healthcare," Sen. Chuck Schumer, D-N.Y., reflected in 2014. Arguably, Republicans could be making the same mistake. The party is fresh off an election victory that delivered unified GOP control for the first time in a decade. But their dire warnings about Obamacare don't always line up with the public's view of the law. A recent NPR/Ipsos poll showed 38% of Americans support strengthening or expanding Obamacare; 31% want it repealed and replaced; 14% want it repealed and not replaced; 6% want it left as is. Democrats think Republicans have over-played their hand. "When you put pen to paper, all hell is going to break lose on your side," Rep. Peter Welch, D-Vt., said during floor debate this week on the budget resolution, "because you have to move beyond the rhetoric to figuring out how you're going to pay to keep our kids on our health care plan, figuring out how to have to pay if we're going to let folks with pre-existing conditions have health care. Those (problems) don't solve themselves, and you don't have a plan." But doing nothing is also not an option, particularly for lawmakers in states where premiums are rising and insurer options are now down to a single provider. Senate Majority Leader Mitch McConnell of Kentucky argued that Democrats face their own political risks by defending the current system. "I would caution our Democratic friends to become the spokesmen for the status quo," he said. "It associates them with the fact that, after Obamacare, there's still 25 million Americans who are uninsured, co-payments are going up, deductibles are going up and premiums are going up. I would also remind them that (Obamacare) is the reason we had a great year in 2010, 2014 and again in 2016."